Pam Coronado’s Bio: Pamela Coronado has been involved in psi criminal work since 1996 when a dream provided her with the information needed to help a search party locate a missing woman in California. That dream and amazing chain of events that followed changed her life forever. “It was the day that Sherri’s parents threw their arms around me and thanked me for helping locate their daughter that I knew I had finally found my life’s work.” says Pam. That passion remains. For the past 12 years, Pam has been actively involved in helping to solve local and regional crimes and mysteries that had become very frustrating for search parties and law enforcement. 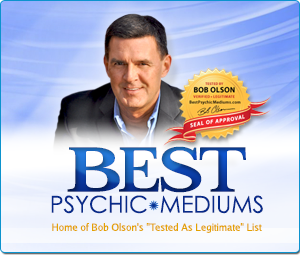 She has consulted as a psychic detective to local, state, federal, international and private agencies. Pam uses clairvoyance and psychometry to gain “insight” into a crime or missing person case. By holding objects worn or loved by the victim, Pam can “tune in” to the person and learn of their current physical state and clues about their location. While no psychic investigator can claim 100% accuracy or provide all of the answers, Pam’s work has proven to be astonishingly accurate and helpful on numerous occasions. She insists that psychics are investigative tools and should work as part of the investigative team. She strives to give useful and specific information and believes that crimes are all ultimately solved by solid police work. Visit Pam Coronado’s website at www.PamCoronado.com. Again, thank you, Bob. How do you find these people?!?!?! I love it! Glad you liked it. I’ve known about Pam for a long time. I was just waiting for the right timing, and I think this was it. You’re right, so much more than you’d expect — deeper and more meaningful. I was very intrigued by Pam Coronado and this entire interview! I think the work she does is amazing and will be looking into her classes in the near future. Having discovered some of my own psychic abilities in recent years and trying to make sense of many things, I believe this may be the direction I am heading. Also read your book, Answers About The Afterlife, which I thought was very inspiring and helpful in understanding life’s journey. Thank you! Working with police is definitely not for everyone, but you know it when you’re called to it. I’m glad it spoke to you. And I appreciate your kind words about my book. Really good interview, Bob; Pam seems very real and no-nonsense (like you)! Still and extreme skeptic myself, it was very meaningful for me to see this – thank you. I certainly understand skepticism as that’s my background too. I think Pam would have been the perfect psychic representative for me back then. So very grounded. Thank you for your response, Bob; much appreciated. It’s a great idea. I’ve been considering different options. Nothing decided as of yet, but I appreciate the push in that direction. This was a wonderful interview. Pam is so matter-of-fact, at ease, it is evident she knows who she is and understands her own worth. I was particularly grateful to have further confirmation that the Soul departs the body before the trauma, are spared the pain. That was the most valuable nugget of the interview for me. Enjoyed Pam’s website and took note she has a beautiful dog whom she takes to the beach … only beautiful people take their dogs to the beach! Thank you. I thought that was very important too. And I’m a dog lover, so I’m right there with you. Mine is 11 and I need to take her for a walk right now. I have tried to find you on tv. I have direct Tv. When are you on and what station? We are an online show on this site only. I appreciate your interest. This was such a great interview. I have recently taken a couple of Pam’s classes and I have to say that I have been so impressed with the way she is able to present fairly “deep” concepts / information in such a concise, down to earth and matter of fact way that just makes sense. My only regret is that I wish I had learned of her sooner. She is very talented and knowledgeable. I think it is wonderful that she is sharing it with the world in such a selfless way. So nice to hear from one of Pam’s students. That’s a wonderful testimonial. Thank you for sharing your experience. I agree with your sentiments. Outstanding interview, outstanding guest. Loved the extended format, thank you for that. Thank you for bringing to our attention talented individuals that bring us an understanding of mediumship in a practical and common sense environment. 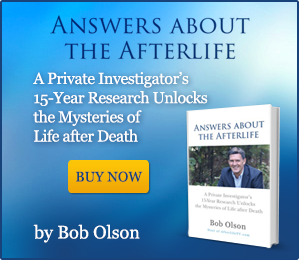 I wish you the best on the afterlifetv project as I am enjoying being part of it and observing how it is evolving into a valuable asset for many of us. I love hearing the real deal. Ya know it right away!!! Clean Spirit!! Thanks Bob, another great interview, and thank you Pam, keep up your great work, you are a Blessing!! Thanks for your comment. Yes, as a former private investigator I’ve been investigating the afterlife and researching psychics & mediums since 1999 — 16 years now. 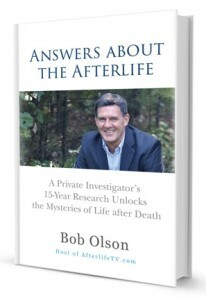 The result of all my research is now presented in my book, Answers About The Afterlife, which you can read about at http://www.BobOlson.com. 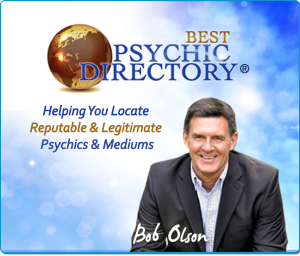 And many people don’t know but I also founded two psychic & medium related sites: BestPsychicDirectory.com and BestPsychicMediums.com. I really enjoyed this show it was awesome….I love Pam and have seen her on TV she is so authentic…..I took her course after listening to your show and was wowed….I truly feel now that this is the area I would love to delve deeper into again Thank You for having her on your show…. I’m glad you liked it. One of the characteristics I really like about Pam is her authenticity. Good luck with your call to this area of contribution. Well there’s really not a lot of opportunity for employment in this area. 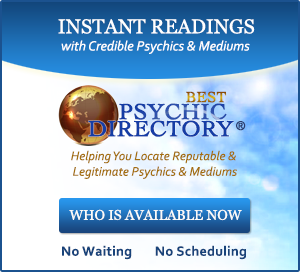 Most psychics with such ability tend to work without a fee – typically helping the police. It makes for a fulfilling calling, but not a lucrative profession. You can learn more about this in my interview with Pam Coronado: https://www.afterlifetv.com/2015/01/29/solving-crimes-finding-missing-persons-using-psychic-ability-possibilities-limitations/ She might have some advice for you as well. Thank you for posting these shows. I don’t miss a one if I can. Thank you Bob and Pam. Pam’s balance, groundedness, respect for all, leave me feeling balanced, settled, peaceful. Bob, I have been tuned in to the gift you give us from the beginning of A L T V.
I was relieved to hear about victims of violence leaving their bodies before “the act”. I am interested to hear if there have been any connections with the Being of Emmett Till who was a young victim of a hate crime – his story of poignancy and greater than usual disturbance. Thank you both. Thanks for your comment. Glad that resonated. Hi Bob,First I’d like to say I always LOOk forward to the shows you have on,You e-mail me so I don’t miss much.I find Pam to be a refreshing twist compared to other guest.I really enjoyed her show ,with you. I have to ask you,I have been having all kinds of psychic experiences,and They are always proved right as time goes by and they’re confirmed.The problem I have is I can’t control what’s coming through,and as far as my spirit guide,I’m not sure if I am getting messages from him/her,or if it’s my imagination.Is their any particular video you have that would help someone like me to have or get better control of what I’m experiencing? 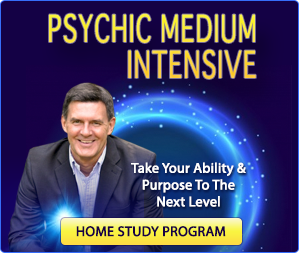 What you need is to study with a reputable psychic or medium. Preferably, you should learn from someone who also offers a circle, meaning the psychics or mediums get together regularly to give readings to one another for practice – with a psychic/medium who facilitates the group. Basically what you’re describing is 1) needing to learn the difference between a psychic and mediumistic message, and 2) needing to learn from an experienced pro how to control what you’re getting. You might consider your local Spiritualist church as they offer classes and circles around the country, and at very reasonable fees. Just Google “Spiritualist church” to find one in your nearby city. Good luck.